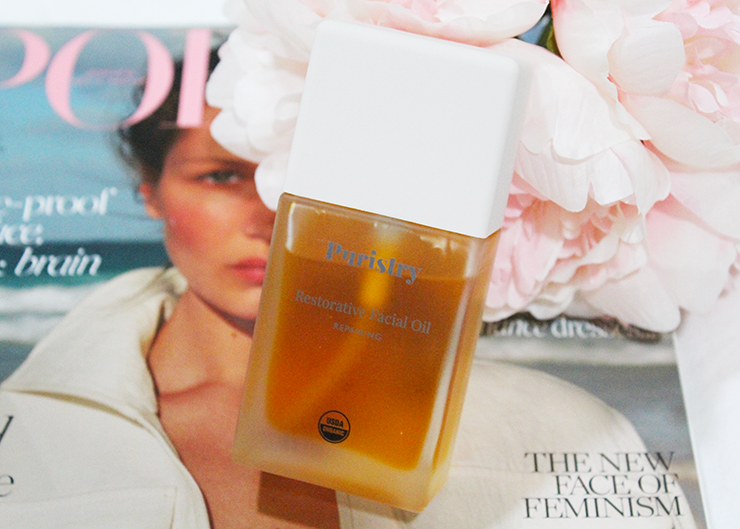 I have very dry skin and am a huge fan of facial oils to help hydrate so I was super excited when Puristry sent me their Restorative Facial Oil to try. This facial oil is not only moisturizing, but it has numerous anti-aging benefits, too. It is created from a blend of high quality cold pressed oils that were chosen for their skin restoring abilities. Moreover, the oils in this blend are packed with antioxidants to help combat and repair the damage from free radicals. Oils like jojoba, pomegranate, green tea, acai, and more come together in Puristry's Restorative Facial Oil to deeply hydrate your skin and to minimize and prevent fine-lines and wrinkles. To use this I wash my face, pat it dry, spritz with a facial spray, and then gently pat the oil into my skin. It's best to apply the oil when your skin is still a little damp from the spray and you can leave it on it's own or add a moisturizer on top of it. I tend to use it without an anything on top of it right now since it's summer and my skin isn't quite as dry, but once winter comes I will definitely be layering a cream over it for extra moisture. You can also use it both morning and night under your usual moisturizers, but I prefer to use it at night so that I wake up with glowing skin. After using it before bed I wake up with hydrated skin that isn't oily or greasy and instead feels restored. I've also been sharing this with my Mom who has a bit more mature skin then me and she really loves it and has seen improvement in her fine lines with use. This oil is especially perfect for summer to repair your skin after exposure to the elements such as the sun, pollution, and air conditioning, which can all damage and dry your skin. It's also a great way to treat your skin to some organic and all natural care that will gently take care of it, unlike other moisturizers that are filled with synthetics and chemicals. Lastly, this facial oil works for all skin types from oily to extra dry and really has something for everyone! Have you ever tried any of Puristry's products? *I was given Puristry Restorative Facial Oil by Puristry to facilitate my review, however opinions of this product are all my own.